On your local ‘A’ road. Every Saturday. 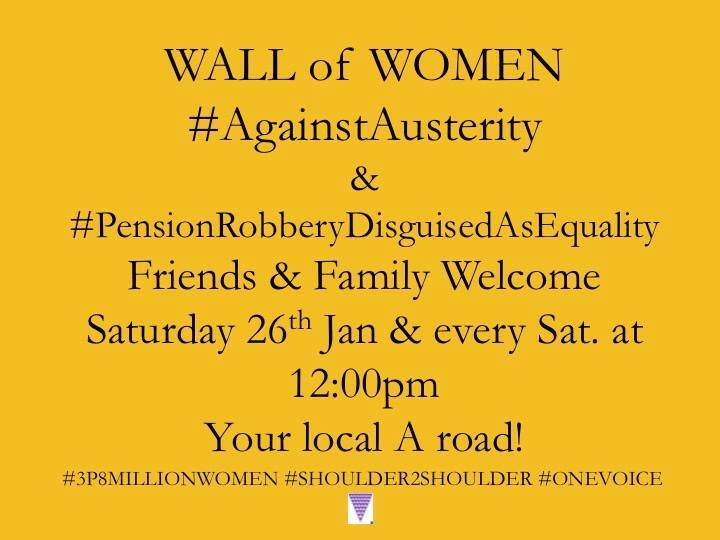 Shoulder2Shoulder have initiated this protest so that women can mobilise their friends, family and neignbours to develop local solidarity with everyone else who has paid into the National Insurance Fund in good faith, only to find out that governments have misled us about our expected entitlements. That includes miners, police officers, judges, prison officers, teachers, all public sector workers – and our children, who are forced to pay in now, while seeing their chances of ever receiving a pension move further and further away. Even couples who are different ages have now been targeted, while those who make these decisions retire earlier with million-pound pension pots paid for from our taxes. Here are the latest confirmed locations for our weekly roadside protests. Bring your friends, family and neighbours. If you can suggest a good location post it in the comments here. KEYBOARD WARRIORS – PLEASE SHARE EVERY DAY – Think about sharing to new groups in your neighbourhood like selling pages and community pages. 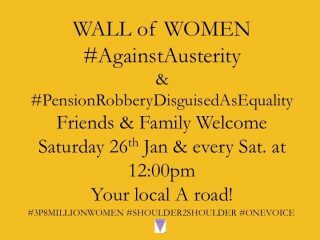 If you want to send in some pics of your roadside protest to encourage others in your area to join in please send them here as a pm. And check out our Weekly Protest Task To Do – there’s a different task each week. This week: please get people to sign this petition. Grab a yellow / pink / orange / green – or whatever colour you like – vest and let’s make some noise! Bring a high-viz and your friends and family. Grab your vests, friends, family and neighbours and see you at 12:00 noon. A6 and A5105 junction Bolton-le-Sands. Meet at 12:00 noon. LANCASHIRE UPDATE: 5 of us met at the A6 junction with A5105.People stopping at the traffic lights waved and hooted in support. A lovely policeman came to see what we were doing and said he was totally behind us. We were wearing high vis and protesting peacefully so he said if there were any objections, we could ring 101 for their help! We are planning to make this a weekly event and get bigger placards and banners. Hopefully more people will join us as the word gets round. A38 Bristol – Bristol College Green: See you at 12:00 noon. A4 / A350 roundabout Chippenham: Grab a high-vis vest and see you at 12:00 noon this and every Saturday. A612 Netherfield Victoria Retail Park B&Q roundabout suggested location. A4161 Cardiff New second suggested location. Outside the WHAT home shop. Please post in the comments if you can do this Saturday at 12:00 noon. A48 Cardiff heading out of Ammanford that leads to M4 good safe space busy road. Top of Tycroes Wales. See you there next Saturday at 12:00 noon. See you there on Saturdays. Grab your family and friends and a high-viz vest and make some noise! Have you asked your families and friends to join this campaign yet? After all, they are also affected by our pension injustice. Will their pensions be safe if we lose this battle? Please SHARE this post to widen our audience and increase our impact. Don’t forget to LIKE and FOLLOW the page to receive future news and updates. And copy and paste the hashtags everywhere.